The winter moth has severely damaged many forests and neighborhood trees on Martha’s Vineyard, including this area of oak trees. A new analysis of the damage done by invasive forest pests shows that homeowners and local governments are being stuck with a $4.5 billion yearly bill for the boring beetles, choking fungi, and rogues’ gallery of other foreign pests that are killing millions of trees across the country. The analysis, created by 16 researchers from nine sources, including the Harvard Forest, says the problem is an unintended byproduct of international trade and recommends shifting the burden of finding a solution onto the international shippers whose solid-wood packaging material is the major route for wood-boring pests and also onto importers of live plants, which can hide pests in leaves, bark, and wood. The study, titled “Nonnative Forest Insects and Pathogens in the United States: Impacts and Policy Options,” makes five recommendations the authors say would significantly slow the import of exotic tree pests. The recommendations include switching to a non-solid-wood packaging material, such as plywood, for pallets and shipping crates, restricting or banning the import of live trees — particularly those related to American species — stepping up inspection, and responding early to stem infestations to stop their spread. The study also recommends improving procedures in foreign countries to ensure shipments are pest-free before they leave, and increasing penalties on shipping companies that don’t comply with regulations. Though many people are familiar with the worst historical outbreaks, such as the chestnut blight that removed what had been one of eastern forests’ tallest trees from the landscape, and the Dutch elm disease that denuded Elm Streets across the country, the report said those are the tip of the problem. On average, the study says, 25 more forest pests become established in the United States each decade and unless steps are taken, that number is expected to climb along with the volume of international trade. With no new measures, the report estimates that three times as many invasive wood-boring insects will be established here by 2050. 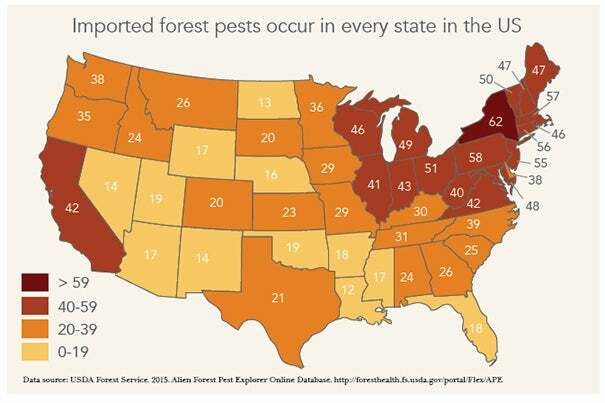 Today, forest pests have become established in every state, with the Northeast and California particularly affected. New York, with 62 imported pest species, is the hardest-hit state, the report says. “The geographic spread of invasive pests and pathogens … in the United States is a mess,” said David Orwig, senior ecologist at the Harvard Forest, and one of the report’s authors. 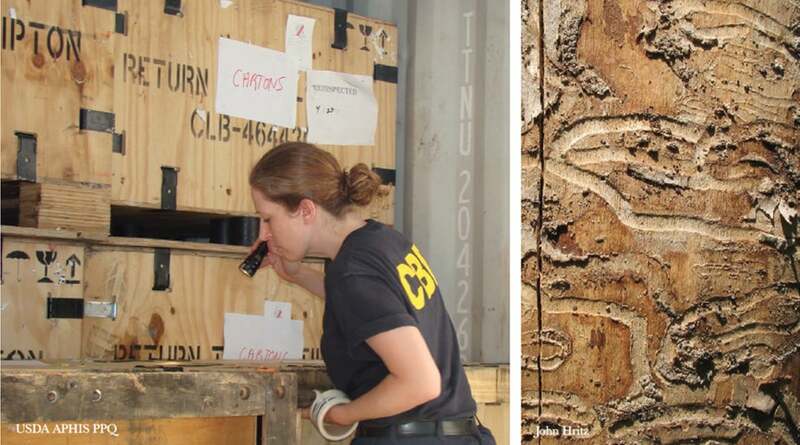 Recent decades have seen a rapid increase in wood-boring beetles, such as the Asian longhorned beetle and the emerald ash borer, because of the rise of container shipping, which uses solid-wood packaging material. The emerald ash borer, a glittering green beetle believed to have been introduced in the 1990s, has been the costliest pest so far. Some $850 million has been spent on control by local governments, a figure the report said could climb to $12.7 billion by 2020. The study details how costs to fight the pests are distributed. U.S. homeowners are the biggest losers, paying $1 billion in direct costs to remove or treat trees and losing another $1.5 billion in declining property values. Local governments come in next, paying $2 billion a year to fight pests, with the federal government a distant third at $216 million, while owners of timber businesses lose another $150 million. As high as those figures are, the study said they could be greatly underestimated, since they consider only the costs of invasive forest pests and not tree diseases. One disease, sudden oak death, is expected to cost California governments and homeowners $7.5 million for tree treatment and removal, with another $135 million added for lost property values. Orwig cited the example of Worcester, Mass., where the discovery of Asian longhorned beetles in 2008 has led to the removal of 34,000 trees, transforming the look of some neighborhoods once shaded by mature trees into that of new subdivisions. Property values declined an estimated 3 to 7 percent, while increased energy use due to a lack of summer shading and winter windbreaks totaled nearly $1 million. Though the economic cost is important, so is the pests’ effect on the forests themselves. Trees are part of a complex web that includes birds, mammals, insects, other trees and plant species, even soil fungi. When an entire species of tree is lost, that shifts the forest structure. The chestnut, for example, was not only a forest giant, its nuts were an important food source. Similarly, the hemlocks under assault by the hemlock woolly adelgid today are preferred by some species of bird and provide the deep-summer shade that cools streams for trout habitat. In addition, pests from past introductions don’t go away, and each new introduction adds to the assault. The study points out that tree pests and diseases are the only threat that has the potential to wipe out entire species. The whitebark pine, native to high elevations in the American West, has been devastated by white pine blister rust, and is the first widespread tree to become eligible for listing on the U.S. endangered species list. The study examined current regulations on solid-wood packaging materials and found them lacking. Though they help some, they eliminate only 52 percent of pests, the study said, in part because of ineffective fumigation and fraudulent labeling of packages as compliant. Improving pest reduction by another 25 percent would bring the United States $22 billion in economic benefits by 2050, the report said, while increasing efficiency by 75 percent would bring benefits worth $31 billion by 2050. The study, published in the journal Ecological Applications, was released Tuesday and discussed by Lovett and Orwig during a Web teleconference. Other Harvard Forest authors include director David Foster, Kathy Fallon Lambert, director of the forest’s Science and Policy Integration Project, and Marissa Weiss, the Science Policy Exchange Program’s coordinator for the forest. Undergraduates Anumita Das '16 (from left), Similou Akintorin '16, and Terilyn Chen '16 and teaching fellow David Wu test the effectiveness of biodiesel made from used vegetable oil from Annenberg Hall.